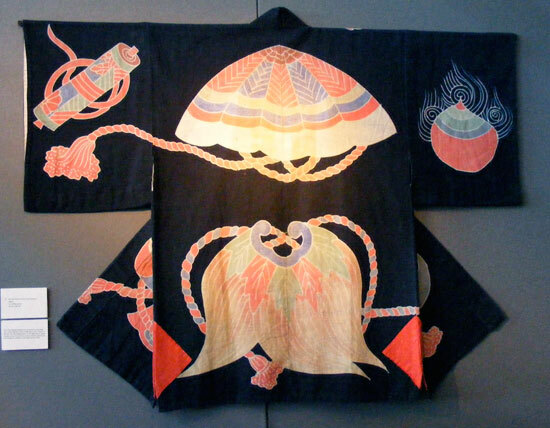 This indigo kimono has designs rendered in colorful dyes done in the tsutsugaki technique, as described in my previous post. It appears to be a festival garment, worn only on special occasions, and the skill used in design and execution of the artwork is obvious even from a distance. The colors are bright and vivid, the lines clear and well rendered. 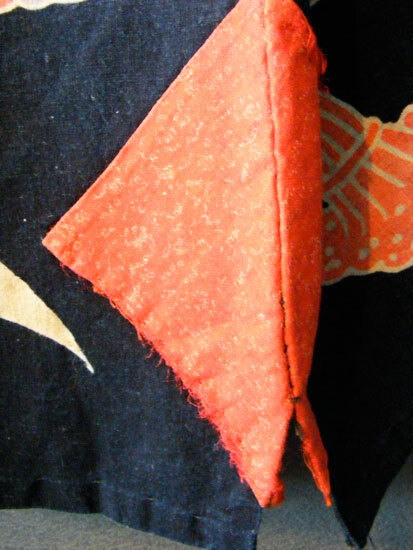 The main design elements on the back include a straw hat and cape (kappa), both likely made from sedge or rice grass. They are not the usual drab pale straw color, but appear to be woven with dyed material and/or colorful leaves. They sport bright, thick cords (kumi himo) that end in heavy tassels. Could it be a legendary Cloak of Invisibilty? To the left is a scroll (kakejiku 掛軸? Correct me if I’m wrong). Barely visible on the front is a lucky mallet (kozuchi 小槌). The designs are fairly provincial, denoting the garment’s country origins. 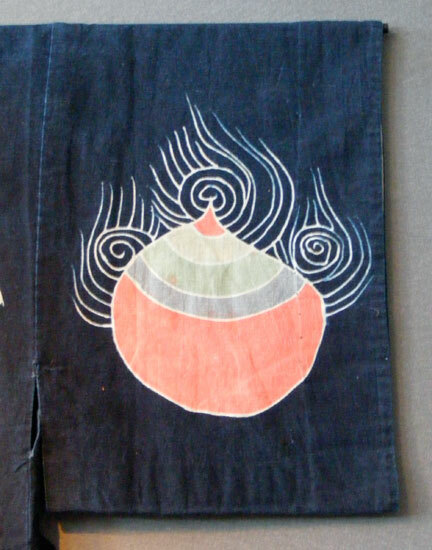 On the back of the right sleeve there is a teardrop-shape design with blue flames (kaen houju 火炎宝珠). It represents a sacred jewel in Buddhism, with the ability to dispel evil, purify, and fulfill wishes. The colored layers represent the materials that make up the jewel, including Buddha’s ashes, precious metals and aromatic woods. I took a closeup of the red fabric near the bottom hem as it intrigued me. The fabric was carefully sewn on at the top, but the edges were left raw at the bottom. It appears to function as reinforcement for the split at the hem, but why sewn in such a way and with such a brightly colored fabric? It does make an interesting visual effect, regardless of its intended purpose. The second item I chose to feature from her booth will be in a future post on ikat and kasuri indigo textiles. As always, Thank You to Vicki for sharing her joy of Asian antiques with me.